Carcassonne, Castles, Chateaux, Citadels, Cathars, Contrasting Countryside, Comfortable Walking, Characterful Hotels, Quintessential Cuisine, Corbieres Quaffing, Charming Companions. This is like a gentle ramble (rather than a route march!) 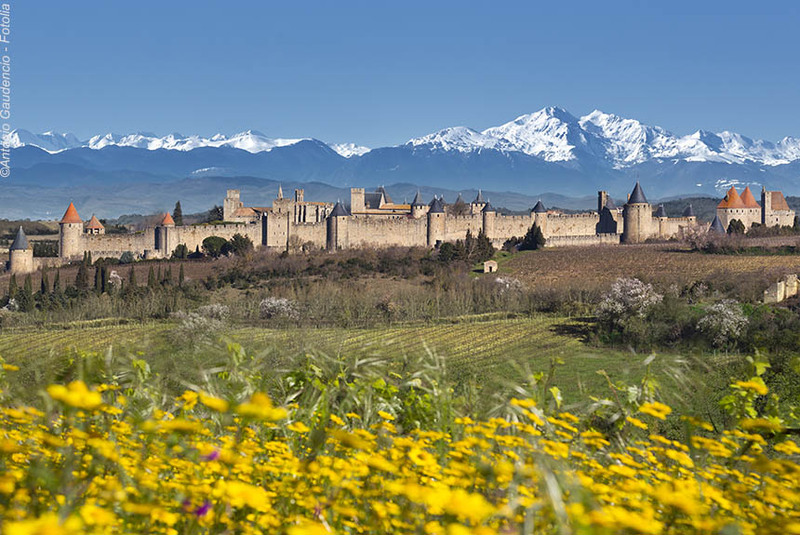 through Cathar Country featuring Carcassonne, and gentle walks through wonderful Corbieres landscapes, villages and towns to visit magnificent castles. 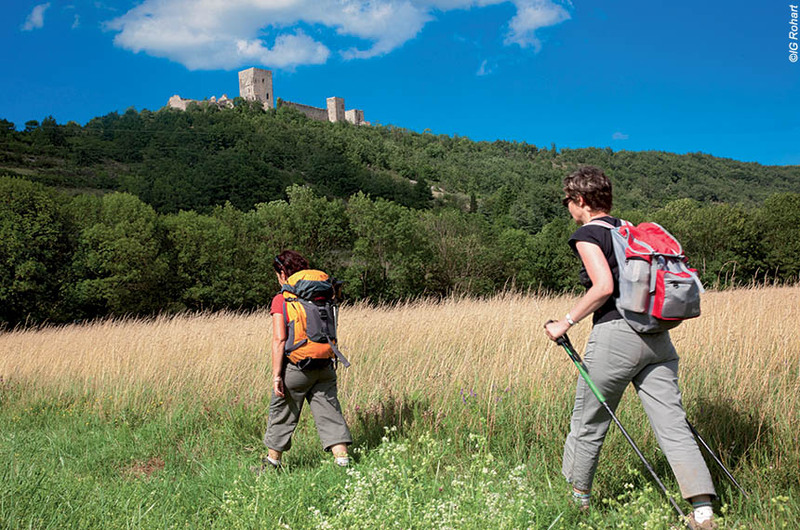 Our bi-lingual guide will get you right under the skin of the region, and give you a series of walking-talking insights into Cathar history. The daily walks are around 3 hours, and you will have plenty of time to relax and explore on your own as well as with the group (maximum 15). You can speak only English, or also French as you choose. We meet you at Carcassonne airport (daily flights from London Stansted), and take you to your hotel just outside the walls of Carcassonne. The three star Hotel Aragon is our pick of the many hotels in Carcassonne because it has a great, quiet location 2 minutes from the ancient quarter, a tastefully contemporary interior design style, well equipped rooms, and efficient, welcoming staff. As the whole point of being in Carcassonne is to roam around the walled city discovering its many nooks and fascinating crannies, we leave you to choose where you dine on this night. You're spoilt for choice. After lunch, you rendezvous with your bi-lingual guide, and your travelling companions - minimum 5, maximum 15 - who will be a mix of English and French speakers, so you can speak only in English, or French as well - you choose. Within minutes, your guide will lead you on a two hour highlights of Carcassonne tour - including both the must-sees and the lesser-known delights. Inevitably, you will then want to revisit places to explore them at your own pace, and visit others that you have only heard or read about, so the rest of the day is yours. You stay again at the Hotel Aragon, and you can use it as the all-day base for your exploring, but in the evening you dine in one of our favourite restaurants in the city with your companions. Now, as they used to say, for something completely different, and something frankly the French do rather well. Deep in an unspoilt and "sauvage" (meaning natural rather than savage) Aude valley there is a facinating and unexpected three hour walk dotted with thought provoking contemporary sculptures. Surely some you will like, a few love, and inevitably some hate, so having companions to exchange views with will make it an even richer experience. You will also have time to stroll around the lovely medieval village of Lagrasse, surrounded by Corbieres vineyards, and renowned for its medieval streets, covered market, 12th century hump backed bridge, and delightful Benedictine Abbey founded in 799. The cloisters evoke a sense of peace that you feel has been experienced for every one of those 1,220 years. We return you to the Hotel Aragon for a last night here, and you dine in another restaurant in the city with your companions. Walking time: 3 hours (plus Lagresse). Elevation: + 250m / - 250m. Transfer time: 1 hour 45 minutes. After breakfast, we take you to the heart of Cathar country to discover the remarkable chateaux of Queribus and Peyrepertuse. 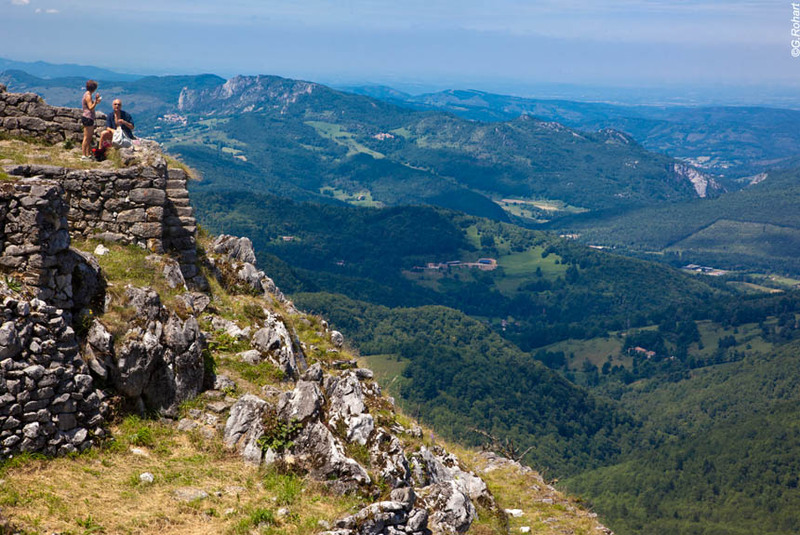 The amazing (truly amazing) and vertigo inducing location of Queribus simply has to be seen to be believed, and when you walk around it is still difficult to comprehend how this could have accommodated the last Cathars who gathered here after the fall of Montsegur. That's why it's known as the last stronghold of the Cathars. 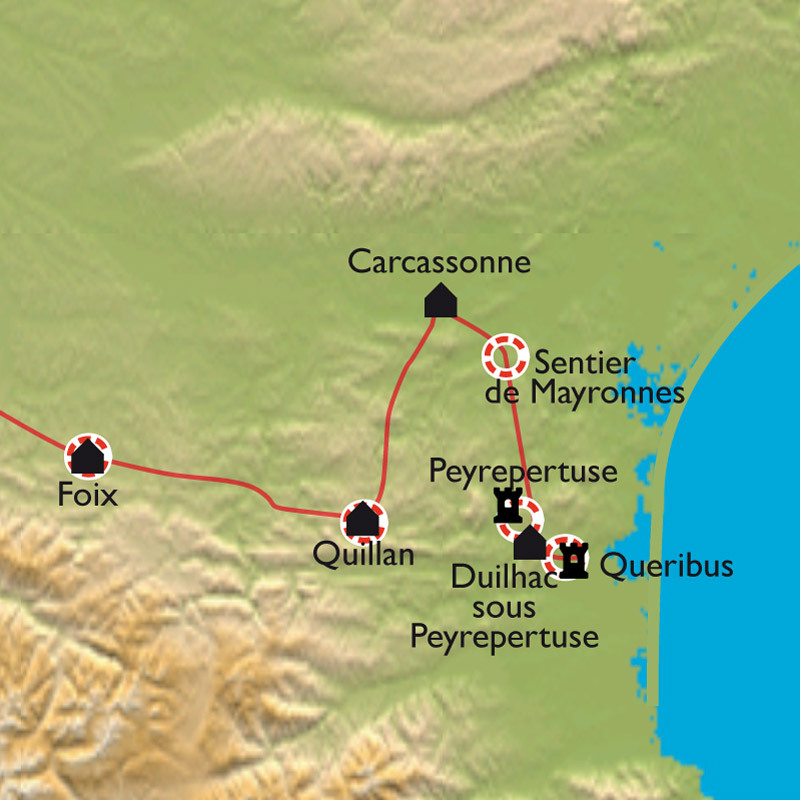 The location of Peyrepertuse is also stunning, but it has a very different and longer history. 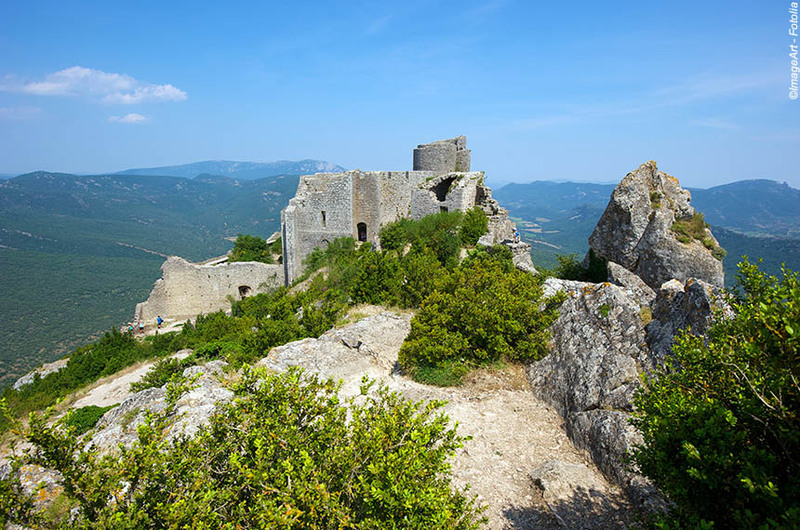 It was built in the 11th century, was a Cathar stronghold, but surrendered before it was attacked, and subsequently became a frontier fort fought over by the French and Aragonese for centuries. Having a really knowledgeable bi-lingual guide adds a whole dimension to these walks and visits. The Hostellerie du Vieux Moulin is a delight as is medieval Duilhac-sous-Peyrepertuse where it's located. It's warm stone walls outside are also found throughout the hotel, and warm too is the welcome. You'll also eat well in the hotel's own restaurant much favoured by locals for reasons that will become obvious to you. There are gorges, and there is the Galamus gorge. Its sheer, almost white limestone cliffs tumble down to a river much loved, these days, by canyoneers, yet since the 7th century it has been favoured by hermits and in the 15th century a monastery was glued on to the cliffs. You walk in the gorge on its narrow (but perfectly safe) paths, and climb up to visit the monastery, then continue, after a short drive, on to the highest point of the day (in every sense) where you'll be pleased (we are confident) to visit the magnificent and surprisingly well preserved Puilaurens castle. Its location is awe inspiring, and its almost complete walls, including an originally Roman tower, give you a tremendous sense of what it was like for the Cathars resisting Simon de Monfort behind its walls. What's more, it provides panoramic views across forests and Alpine meadows up to the true Pyrenees, and down towards the Mediterranean itself. Magnificent. The three star Hotel Chaumiere is right in the middle of the charming and historic town of Quillan, which itself is the middle of Cathar country. It's a small, contemporary hotel with good rooms, good facilities, and a good restaurant. Perfect for a good night's stay. Walking time: 3 hours. Elevation: + 300m / - 300m. Transfer time: 1 hour 30 minutes. Today you walk the Troubadours path - so called because in 1170 and in many other years troubadours from across the west and south met at the chateau/castle of Puivert to celebrate their culture and their spirit of independence that chimed so well with that of the Cathars. The castle is fairly good condition, certainly giving a powerful sense of what it was like for lords, ladies, troubadours and Cathars, and is slowly but surely being repaired - sensitively so - by its private owners. You visit the fascinatingly intermittent Fontestorbes river in Bellesta - one minute water trickles from an underground cavern, and minutes later 5 times as much is pouring out. Then it's on to one of the premier highlights of any Cathar tour, the eagle peak of Montsegur. Its isolated location seems to echo the isolation of the Cathars as they faced Catholic forces from across Europe. A tragic historical place that your guide will bring to life as far as possible. Everywhere in Foix - an authentic town we really like - is dominated by its justly famous 7th century castle-on-a-rock, and the three star Hotel Restaurant Lons is no different. It is an old coaching inn, now fully brought up to date, right beside the river Ariege, and a 5 minute stroll from the castle. It has a good reputation for its cuisine, so we believe you will really enjoy staying here, which you do for 2 nights. Walking time: 2 hours 30 minutes. Elevation: + 300m / - 300m. Transfer time: 2 hours. After breakfast, you will visit the historic and colourful market in Foix, and then the castle itself before a short drive for a delightful walk along ancient footpaths and cart tracks through lovely wooded countryside dotted with stone farmhouses, abandoned barns, orchards and private vineyards. 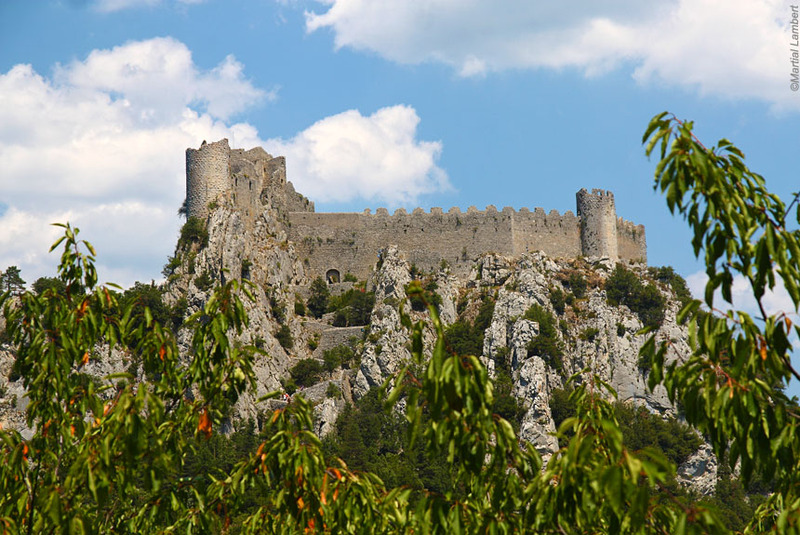 The highlight, though, is the formidably positioned castle of Roquefixade, blooded with Cathar history, and a fitting finale for your Cathar tour. A short transfer gets you back to enjoy Foix and the Hotel Lons. Walking time: 3 hours. Elevation: + 300m / - 300m. Transfer time: 1 hour. After breakfast, you are taken back to Carcassonne for a final night there. You can then say your "formal" goodbyes to your guide and travelling companions. We leave you free for the afternoon, and to choose your dining companions, and your restaurant on this final night. After breakfast, we take you to Carcassonne airport or train station. We will meet you at Carcassonne airport or railway station. We will take you back to the airport or train station at Carcassonne. This holiday features comfortable walking with some short, steep slopes, usually 3 hours or so a day with moderate ascents and descents of just a few hundred metres, so is suitable for people who are reasonably fit, and used to walking (albeit "gently") for a few hours a day. It can get hot in July and August, as well as more crowded. We would recommend June and from mid August through September and well into October as the best months. We will transfer your luggage between each hotel, so all you need to carry when walking is a daysack with whatever you regard as essentials, and, where relevant, your picnic. This holiday is led by an experienced, bi-lingual guide with mountain walking qualifications and a wide knowledge of Cathars and the region. You need only speak English if you so choose. You stay in three star hotels as specified, or similar, in double or twin rooms with en suite facilities. Journeys by road are by comfortable coach, minibus, or taxis. You need to keep your passport with you at all times, and ideally insurance information. You need to make your own arrangements to claim local healthcare. There are requirements in France for all vehicles to carry safety equipment.